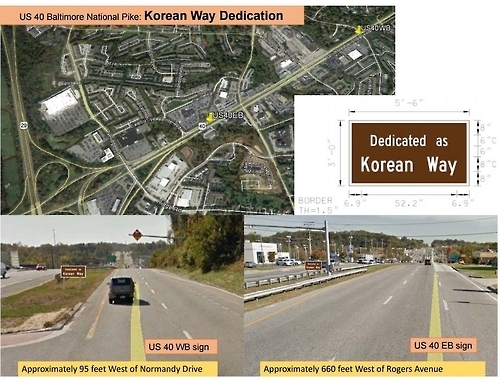 A section of a Maryland road will be named "Korean Way" in recognition of Koreans' contribution to economic development and cultural diversity in the US state, the office of Gov. Larry Hogan said Tuesday. The section of Maryland's US Route 40 stretches about 1 kilometer and passes through the Ellicot City, one of the most densely Korean populated towns in the state with a lot of Korean-run shops and restaurants. About 7 percent of the town's 66,000 population are Korean. Two "Korean Way" road signs will be set up on Dec. 20, the office said. The association of Korean Americans in Maryland first proposed the idea, and the Maryland's government decided to endorse the proposal despite initial reservations and opposition from the state transportation department about naming a road after a specific nation or ethnicity. The designation was made possible thanks to strong support from the governor. Hogan, who is married to Korean-American artist Yumi Hogan and calls himself a "hanguk sawi," which means a "son-in-law of South Korea," has been very supportive of Korean Americans in his state. In January, Maryland also designated Jan. 13 as "Korean-American Day" and April 15 as "Taekwondo Day."